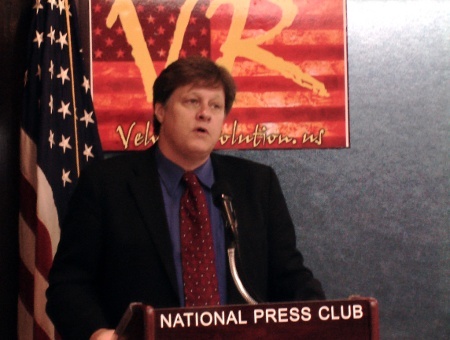 Velvet Revolution attorney Kevin Zeese, speaking at the National Press Club on Monday. Speaking at the National Press Club on Monday, former Reagan administration Associate Attorney General Bruce Fein lamented President Barack Obama’s decision to shut his eyes to open confessions of war crimes by members of the prior administration. Fein was making the historical argument with respect to the Obama administration’s continued refusal to investigate the Bush administration’s torture program, which was designed and specifically authorized by high-level officials. Fein was speaking on behalf of Velvet Revolution, a coalition of over 150 peace and religious groups, that is leading the charge to get attorneys involved in the Bush administration’s torture program thrown out of office and the legal profession. Monday, the group registered complaints against CIA lawyers Jonathan M. Fredman and John A. Rizzo, who still draw salaries from the Obama administration, in spite of the president’s public condemnation of torture. Fredmen, who is currently counsel for the Office of the Director of National Intelligence, served as the Associate General counsel for the CIA from 2001-2004. Rizzo is the current Acting General Counsel for the CIA but is retiring this month. His nomination to become full General Counsel has been held up for years over his alleged role in enabling the CIA’s controversial interrogation program. Details of the complaint were explored in an exclusive RAW STORY report by investigative reporter Larisa Alexandrovna, published early Monday. Velvet Revolution attorney Kevin Zeese, along with Fein, discussed the complaint against the lawyers during a conference at the National Press Club. Video of the presser was not immediately available, but Zeese gave this brief summary afterward. This video was published to YouTube by Velvet Revolution on June 29, 2009. The full press conference was posted to the Internet late Monday afternoon, viewable below. These videos were published to YouTube by Velvet Revolution on June 29, 2009. The group also filed similar complaints against other members of the Bush administration on June 19, accusing attorneys of having “violated the rules of professional responsibility” in their authorization of torture.